Any dish that has the word artichoke in the title is sure to capture our attention. It is one of our favorite vegetables, from globe artichokes hearty enough to feature in a meal to bite-sized marinated hearts on a classic Italian deli sandwich. 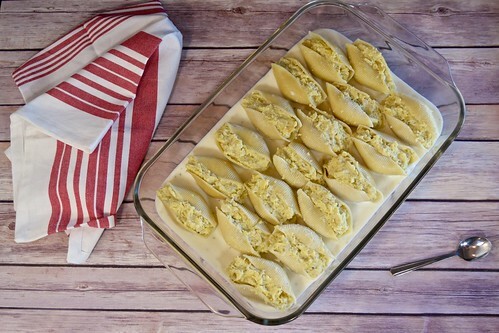 So when we discovered this great recipe we were immediately intrigued, especially since these baked shells are not filled with the usual ricotta, but rather with brighter and more interesting ingredients. 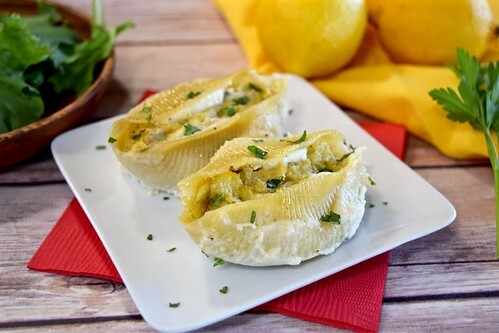 With caramelized onions and artichoke hearts sautéed in browned butter, a splash of white wine, and savory parmesan and pecorino cheeses, this delectable filling is complemented by a silky lemon béchamel enhanced with a touch of fresh ricotta, making an elegant baked dish that is unique and delicious. We adapted this from Deb Perelman’s Smitten Kitchen Cookbook, which is filled with wonderful dinners, snacks and desserts. We have been following her blog for years and her site has been an inspiration. Like us, she cooks in a small kitchen with no dishwasher so her book is written with that in mind, suggesting techniques and tips to make the cooking process as easy as possible. These shells are the perfect example of this: the pasta, filling, and sauce can all be prepared in the same pot, saving you time and dishes. We made a few changes to the original recipe. 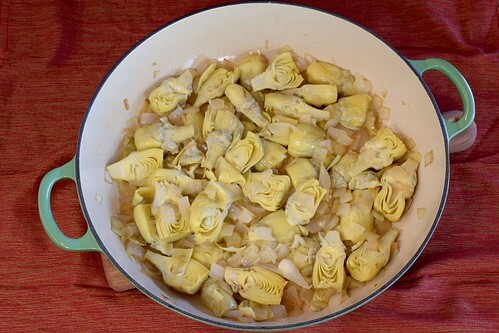 We use canned artichokes instead of frozen, and increase their amount. Also we add a little more pecorino and parmesan in the filling, and boost the lemon in the béchamel sauce, intensifying the tart citrus flavor. These shells feature artichokes in the best way possible, with sweet caramelized onions and browned butter in a delightful sauce that makes for an irresistible baked dish, especially if you love artichokes as much as we do! 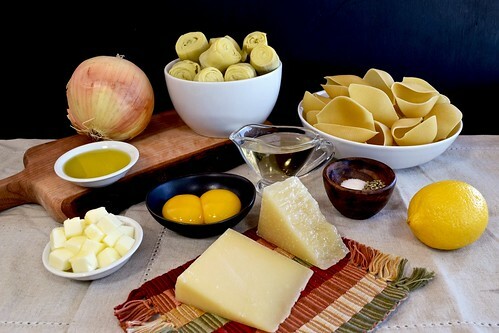 In a large pot, bring 4 quarts of water and 1 tablespoon of salt to a boil, and cook pasta shells according to package directions. Then drain, and toss with a little olive oil to keep them from sticking. The empty pot can also be used to make the filling, if you would like to cut down on dishes. In a large skillet (or the empty pot you used to cook the pasta) over medium heat, melt the butter, and cook until it turns a toasty brown color, stirring to keep the solids from burning. Then add the olive oil and the diced onion, and cook until the onion softens and begins to caramelize, about 7 to 10 minutes. Add the artichoke hearts, and cook for 5 minutes, stirring occasionally. Then add the white wine and cook until it disappears. Remove from heat and allow to cool slightly. Transfer the artichoke mixture to a food processor, and also add the pecorino cheese, parmesan, egg yolks, lemon juice, salt, and pepper. Pulse until the mixture is well-chopped, but still slightly coarse, not puréed. The pot can be dried out and used yet again to make the sauce, if desired. In a large pot, melt the butter over medium-high heat. Once it is melted, add the flour and whisk until smooth. Add the milk very slowly, starting with just a little pour at a time and whisking constantly to keep lumps from forming. Once the mixture reaches the consistency of batter, the milk can be added in larger pours, still whisking constantly. 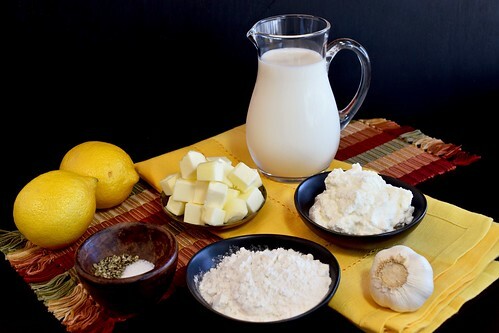 Once all the milk has been added, whisk in the minced garlic and bring sauce to a boil, continuing to stir. When boiling, lower heat to a simmer and cook for 2 to 3 minutes. Add the ricotta, lemon juice, salt, and pepper, whisk until smooth, and remove from heat. Adjust salt, pepper, and lemon juice to taste. Preheat oven to 350°F. 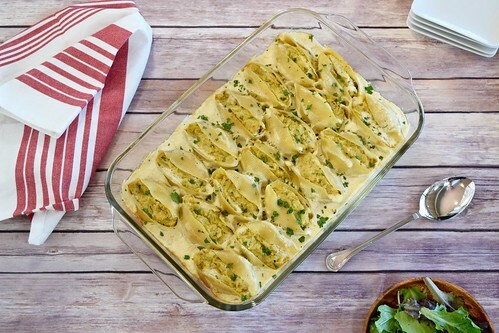 Pour 2 cups of béchamel sauce into a 9×13-inch baking pan (there will be about 1/2 cup of sauce left). 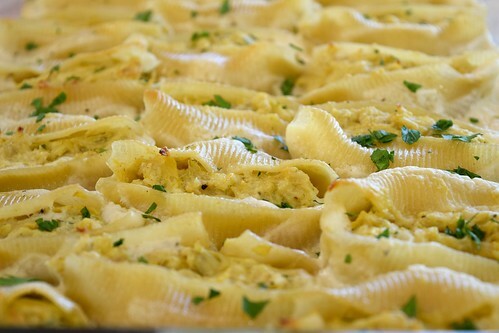 Place 2 tablespoons of artichoke filling into each cooked pasta shell, and arrange them seam-side up in the pan. Using the remaining sauce, spoon a little over each shell until all the sauce is used. Cover dish with foil and bake for 30 minutes, then remove foil and bake for another 15 minutes. Sprinkle with parsley or basil if desired, and serve immediately. — While the shells cook, a few may tear, so we often cook a couple extra just in case. Artichokes are one of my all time favorite hodaily recipes for Easter mom used to make them and I would fight for the heart I now realize the memories she gave me with this precious vegetable to cling to those days yours looks amazing. Just perfectly stuffed I can just imagine how fabulous the aroma of these were cooking BRAVO!!! Simple is best. These are perfect! Congrats on your well deserved awards!